Ok, it’s hard to deny the fact that I’m seriously nesting in our flat now! The last couple of weekends have been entirely furniture focused. 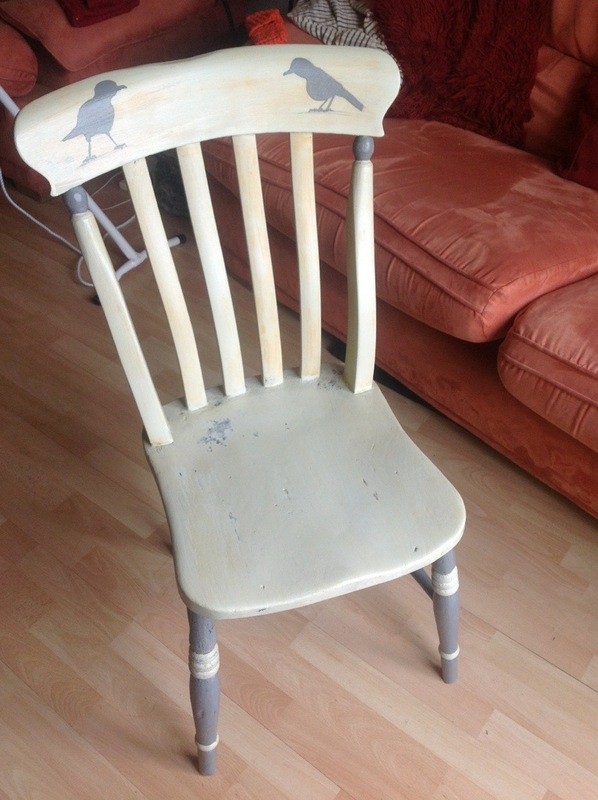 This is an old chair that my grandma gave me for the new flat. I started sanding it down by hand but after about 2 hours I decided enough was enough and went on a trip to B&Q! It still took another couple of hours to sand down the rest of it with my new precision machine sander! I know, I hear your ‘oohhs’ and ‘ahhs’ from here! Anyway, I’m undecided if I like the fact that the varnish took a bit of my paint off or if I’m annoyed by it…I definitely like the birds anyhow! I would love to tell you that I did all of this myself, spent hours concentrating on minute details and finally realised this wonderful creation but, unfortunately, my better half reads my blog and he might not be impressed! – you won’t like him when he’s mildly un-impressed…ye, I know not even a minor link really, I’ve just been watching too many movies!! Anyway, the point is that my partner printed out a risk board map, scalpeled it into the table then spent most of last weekend, his week nights and today painstakingly painting each country on to our wonderful table. 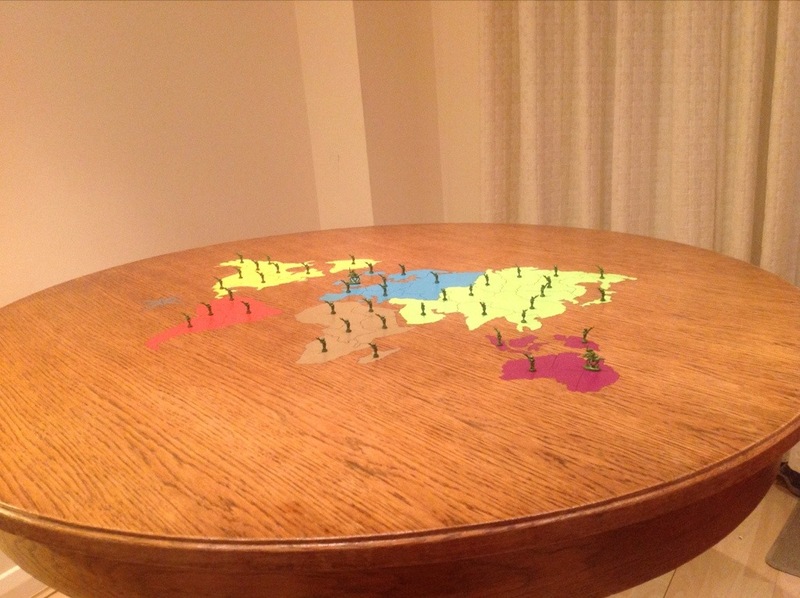 Now this table has been passed down from my step mum who was passed it from here mum so…I hope that they like risk! We were going to play on it tonight but the attraction of Mario party 8 is way to much for mere crafters such as us to escape! I think that my partner is exceptionally happy that this one is finally finished, since the day we moved in I’ve been saying that we need bookshelves. Even with a big box full of books, he disputed this as a requirement. Now, I will agree that food is mildly more important week by week but who can live without neatly stacked books and trinkets on display?? Not me, I can tell you that! We saw a billy bookcase a while ago at ikea that had a really funky design on the back and was going to get that on our latest reccie but it wasn’t there, the next best thing just didn’t quite cut it so, we snuck into B&Q like the crafty ninjas that we are and found these amazing samples of wallpaper just jumping into our arms! 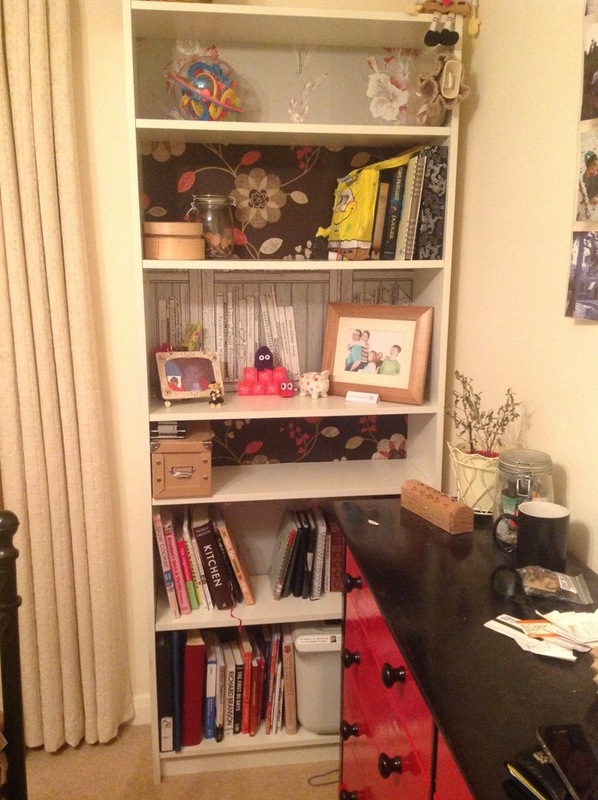 A bit of PVA later and a lot of pushing to get the back in place and you have a wallpapered bookshelf! I love them and can finally display my essentials! All of these were way easier than I thought they would be, I can’t speak for the risk table of course! So if you are hesitant I would say just go for it, most things can be sanded, stripped or hidden if they don’t work!